THIS IS THE BEST HUMMUS EVER! I am normally careful with things like best ever, ultimate and so on but in this case I cannot help it. 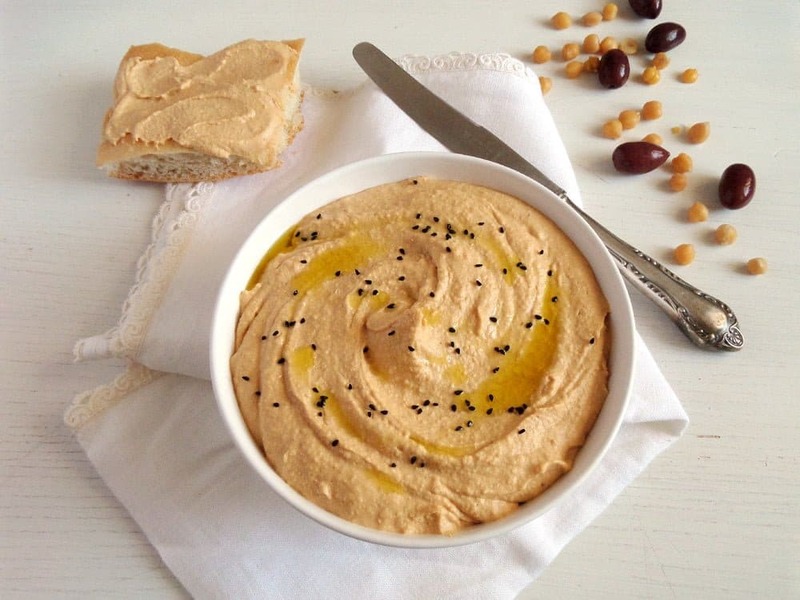 There was never a better hummus for me and trust me, I made and ate lots and lots of them, endless variations of it, with chickpeas or beans or lentils, with beets or carrots, with sesame paste or peanut butter, I even put feta or cream cheese in it. Not to mention the constant changing of the spices: cumin, coriander, paprika, even garam masala or another curry powder. I really liked most of them but this one, seriously, cannot be topped, in my opinion. Could be the garlic in it or the nigella seeds that add a little bit of something else, its creaminess …. I don’t know, probably the combination of them all. I made quite a huge batch that kept in the fridge for about a week before it was all gone. We ate it on bread and with bread chips, I dipped veggie sticks in it (or just my finger every time I opened the fridge), we had it as a side dish for köfte (Turkish meatballs) and chicken skewers. It was amazing every time! I cooked my own chickpeas but I am sure you could make this with canned chickpeas as well, I could not tell you if it would make a big difference in taste, as I have never made this particular hummus with canned chickpeas. But cooking your own is not a big deal, it just requires a bit of organization and time. Remembering to soak the chickpeas the night before I want to cook them is the biggest challenge for me. 🙂 If you have overcome this difficulty just rinse your chickpeas before you start cooking them, pour plenty of water in a large pot and add 1 teaspoon bicarbonate of soda to the chickpeas. Cook until they are really really really soft, cooking time always depends on the size and age of the chickpeas. On the packages I buy it is usually written that 30 to 45 minutes would be enough: that is a lie! 🙂 My chickpeas always need at least one and a half hours if not longer. I always cook a big batch of chickpeas, normally a whole 500 g package. I take what I need and freeze the rest, they keep perfectly for a long time. For this recipe you will need some cooking water as well, so don’t throw it all away immediately. 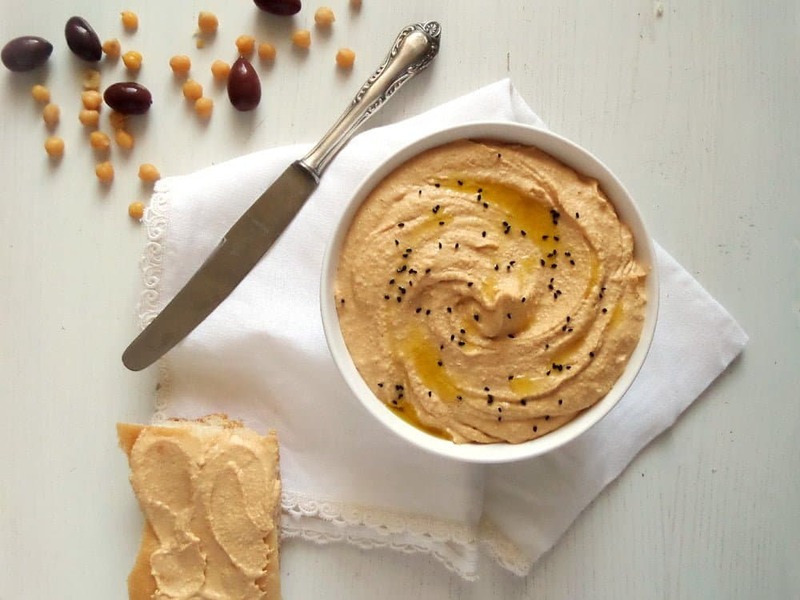 You might think I am crazy but I am planning to freeze some portions of cooking water the next time I cook chickpeas just to be sure I have some when I want to make this hummus without cooking fresh chickpeas. I wonder how that will be. To get 250 g/ 8.8 oz cooked chickpeas, you will have to cook about 125 g/ 4.4 oz dry chickpeas, but I totally recommend cooking more and freezing the rest. We already talked about cooking the chickpeas yourself. You can use canned ones for conveniece, but I do believe that the ones you cook yourself are better. Not to mention, that if you cook your own chickpeas you will be able to use that glorious cooking water for your hummus. Then, do choose a good tahini, I have tried quite a few different ones since discovering hummus, but they are not all of them to my liking. However, I am pleased to say that I have found a few brands that I like and this Tahini is one of them. Fresh garlic is mandatory, I used two very large cloves and they were not too much in my opinion, but I do adore garlic. Don’t even consider using garlic powder or something like that or you will ruin the hummus. Start with one garlic clove and add more according to your taste. If you blend your hummus with a hand held mixer, do grate the garlic cloves before giving them to the chickpeas, to make sure you will not have any larger pieces of it in your mouth later on. Use the spices generously, there is nothing worse than a bland hummus and don’t forget the nigella seeds on top, they really add a little bit of extra something. I make the hummus in my Thermomix and I do recommend using a good and powerful kitchen machine to get a really nice creamy consistency. Don’t forget to scrape the walls of your kitchen machine several times in between and continue processing the chickpeas, adding a bit of cooking water from time to time, until you reach the perfect consistency. Soak the chickpeas overnight or up to 24 hours in plenty of water. Drain, rinse and give back to the pot. Cover with plenty of water again, add 1 teaspoon bicarbonate of soda, bring to a boil and cook, covered, until the chickpeas are really really soft, it will take more than one hour, depending on size and age of the chickpeas. When the chickpeas are soft, drain not forgetting to keep some of the cooking water (about 1 cup of it) and leave to cool. Weigh 250 of cooked chickpeas and freeze the rest. Place the chickpeas in the food processor. Add the grated garlic cloves, olive oil, lemon juice, tahini, salt, cumin, coriander and paprika and process until really smooth, scraping the walls of the food processor a few times in between. Add some cooking water little by little to obtain the desired consistency. You don't have to add it all, just stop when you think the consistency is right, it should have more or less the consistency of mashed potatoes. Adjust the taste with more lemon juice or salt. Transfer to a bowl, add a small splash of olive oil on top and sprinkle with nigella seeds. Enjoy on bread, with bread chips or vegetable sticks or even as a side dish for meatballs, chicken or lamb. I have not cooked my own chickpeas, but I think I need to start. I love your tip about freezing the extras and the cooking water too! 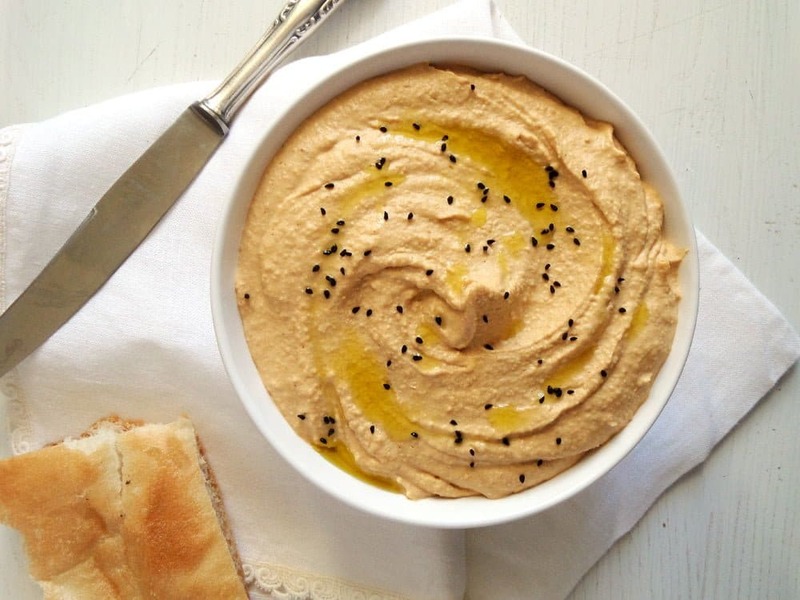 Now about this hummus…yum! It really looks delicious! There’s nothing better than making your own and I love the seasoning you’ve used. Thank you, Kathy. The freezing is great, I also do it with beans. It saves a lot of time and energy to cook a larger batch. I am a self proclaimed hummus aficionado, so you know I MUST make yours. 😉 From the ingredients it looks pretty delicious, girlfriend! Cheers and happy almost weekend!! P.S I cook my chickpeas in the slow cooker – requires no soaking. It would be great if you would make this, Cheyanne. I am sure you would like it especially if you like garlic. I’d love to have a slow cooker, but they’re not very popular around here, therefore very expensive. I used to use my pressure cooker for this purpose, it went much quicklier, but it is broken now, I have to get a new one. I love hummus, with crackers, vegetables, or as a spread for a wrap. And this looks perfectly smooth and wonderful! I only made it at home once and it didn’t have the consistency I was hoping for so I haven’t made it again. Glad you shared this ultimate recipe. I’m sure it’s worth the effort! I had the same consistency problem many times, it must be the main reason of why some hummus recipes are not so great. The cooking water solves the problem in my opinion, when it cools it is almost like gelatine, I guess that makes the hummus so perfect. I never cook my own beans these days – too much work 🙂 I love hummus and yours look awesome! I’ll give it a try with canned chickpeas! 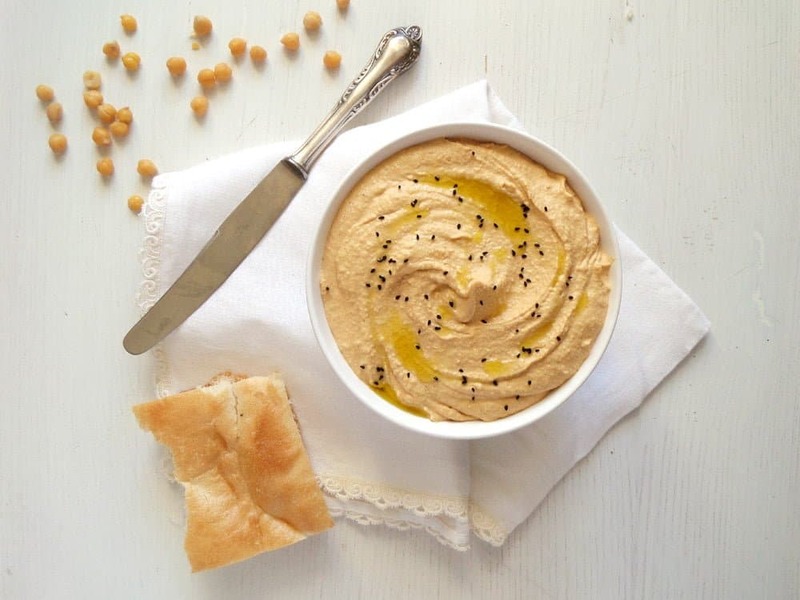 Yum, I love making my own hummus but I always use canned chickpeas – I need to cook my own! That is a great tip about freezing the extras. And I love the spices you have added here to your hummus. Pinning so I can try it! I want to make your hummus recipe but with canned chick peas. Do I need to add baking soda ? Thanks. No, Ruth. You only need baking soda for cooking dried chickpeas. I’ve made your hummus recipe several times now. This time I went to make it and realized I only had smoked paprika. Wow, made it even better! Thank you for a great recipe! The teen in the house loves better than the expensive store bought. I am so glad to hear it, Anne. I also like this better than the bought one. Thank you for the feedback.